"Tragedy of an Idealist. "Ludwig of Bavaria," by Ferdinand Mayr-ofen. Illustrated. Cobden-Sanderson, London. 15/. From the publisher. 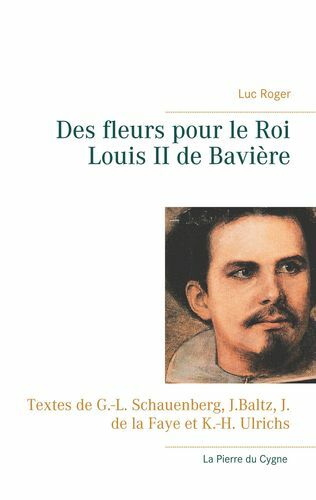 HAD Ludwig II of Bavaria been born a couple of centuries before his time, he might consistently have lived up to the phrase that so captivated him in his earlier years-the grandiloquent "L'Etat, c'est moil" of "le Roi Soleil." As it happened, the youthful idealist, who became a king at 18 years of age, and who was so romantically attractive in his personal appearance that the populace fought in the streets for his portraits, lapsed in middle life into a degeneracy that manifested itself in his wayward and fleeting amorous intrigues with elderly and robustly proportioned actresses, and an extreme repugnance to anything "outre," or even a little out of the ordinary, in the physical attributes of those by whom hewas surrounded, were they ministers of state or the lackeys in attendance on his royal person. 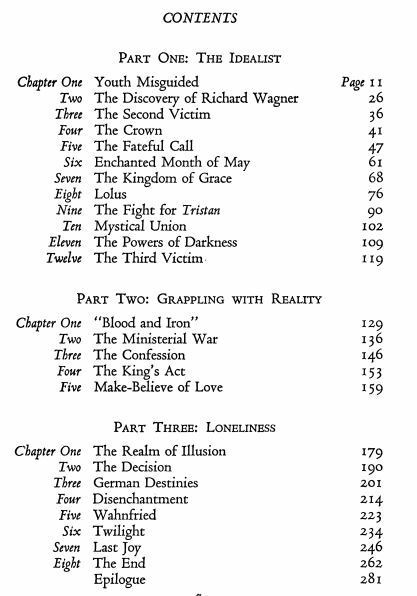 In short, Ludwig would have been a gift direct from heaven for the modern psychiatrist - the pseudo-science was then in its infancy - as it is one is left to judge of his actions by the historical records of his time -his complexes and repressions, his inhibitions and fixations remain a sealed book to us. century - Ludwig accomplished the two outstanding achievements of his unhappy and squandered career - his rescue from a state of indigence of Richard Wagner, who at that period was literally on his beam-ends, and greatly preoccupied in eluding his creditors; and his co-operation with Bismarck in the establishment and unity of the German Reich. The end came in the middle eighties, after Ludwig - like his brother, Otto - had been certified insane, at Schloss Neuschwanstein, with its fantastic sugar-loaf turrets, in a sublime setting of rugged mountains and forested hills and dark and tarn-like lake, whither the deposed monarch had been conveyed, and where he was incarcerated, despite a spirited attempt on the part of the loyal villagers of the Schwangau district, armed with axes, hatchets and flails, to defend their sovereign against this ultimate indignity. But on the evening of Whitsunday, at the close of a serene day in June. Ludwig, accompanied by his attendant physician, Dr. Gudden, went out for a little stroll and fresh air. 'They did not return at the appointed time. A search was made by the side of Starnberg Lake: "At a very short distance from the shore-the lake here was barely six feet deep-they found Dr. Gudden's body, sitting upright in the water. A few yards further on the King's body was discovered, floating, face downwards,on the water. Dr. Gudden's face was injured; he had a blue mark over his right eye, and other scratches and bruises. 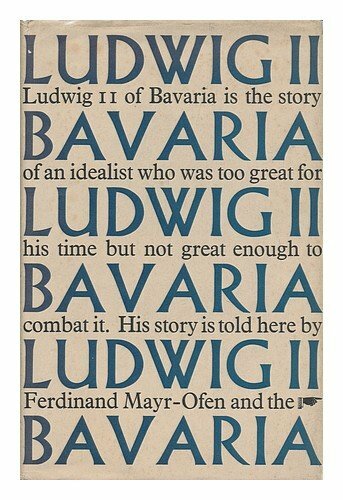 Ludwig and he had evidently fought. Legend has made Dr. Gudden the King's murderer, but there can be no doubt that . . . the King had resolved on flight. He was a magnificent swimmer, and had jumped into the lake, intending to swim to the opposite shore. Elizabeth (Empress of Austria), the only person who still loved him, would help him further, and, once free, he would regain his kingdom. But Gudden had clung to him. They had fought and, fighting, sunk into deep water. Ludwig, unable to shake off the doctor, had taken him along into death." Ludwig was buried beside his ancestors in the church of St. Michael, Munich; and the mournful ceremony was about to close, "when suddenly there was a terrible clap of thunder and from unclouded skies a fork of lightning came down and struck the church of St. Michael. Nobody was hurt; only thick smoke filled the church. The ceremony was over, and King Ludwig II was buried in the vault. But from this streak of lightning which had descended from a blue sky the people read a portent telling them that their King had been sacrificed. In human memory Ludwig remained the hapless King, the King of beauty, misunderstood by his age. Now, after his death, his people loved him. Everywhere, and particularly in the mountains, young men carried his picture. They hung it upon their dress, upon their hats; they nailed it to the walls of their rooms, worshipping it like the picture of a saint." 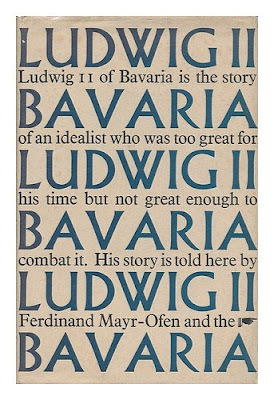 Ludwig's whole life and career may be summed up in the author's words, "(he) was an idealist whose tragic destiny lay in being too great for his time - but not great enough to combat it." In his dual mode of life, reason and passion were too seriously opposed, and he was not mentally adapted to stand the strain of that unceasing conflict. Otto Zarek, Ludwig II. von Bayern: das Leben eines tragischen Schwärmers , Vienne, E. P. Tal Verlag; parution en anglais sous le pseudonyme de Ferdinand Mayr-Ofen et le titre Ludwig II of Bavaria, Tragedy of an idealist, Londres 1938 et New York 1939.